These images can be reproduced if credit is given to the Nordic Optical Telescope and observers listed below. Please, read the full copyright notice for other uses. 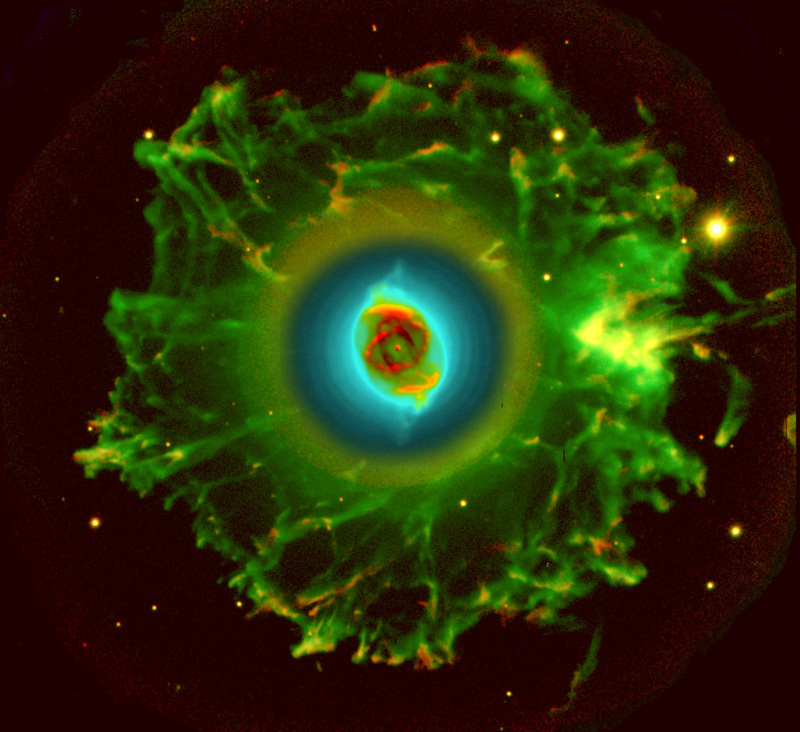 It was featured on NASA's astronomy picuture of the day the 3. Nov. 2010 which can found here. 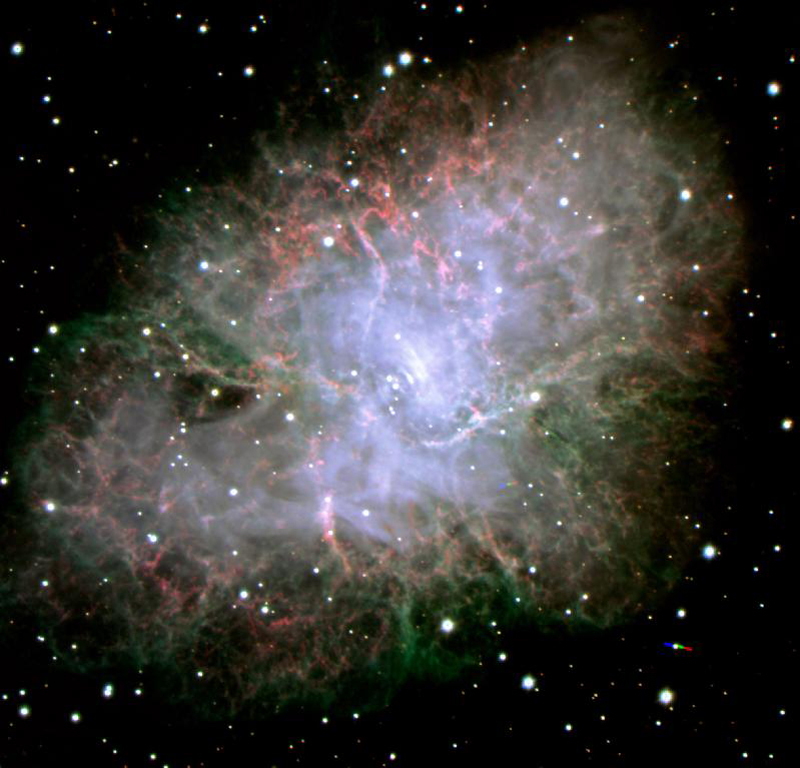 Credit: Romano Corradi (IAC), et al. JPG (6.8 MB) Caption: Nova remnant GK Persei. Imaging done with ALFOSC. 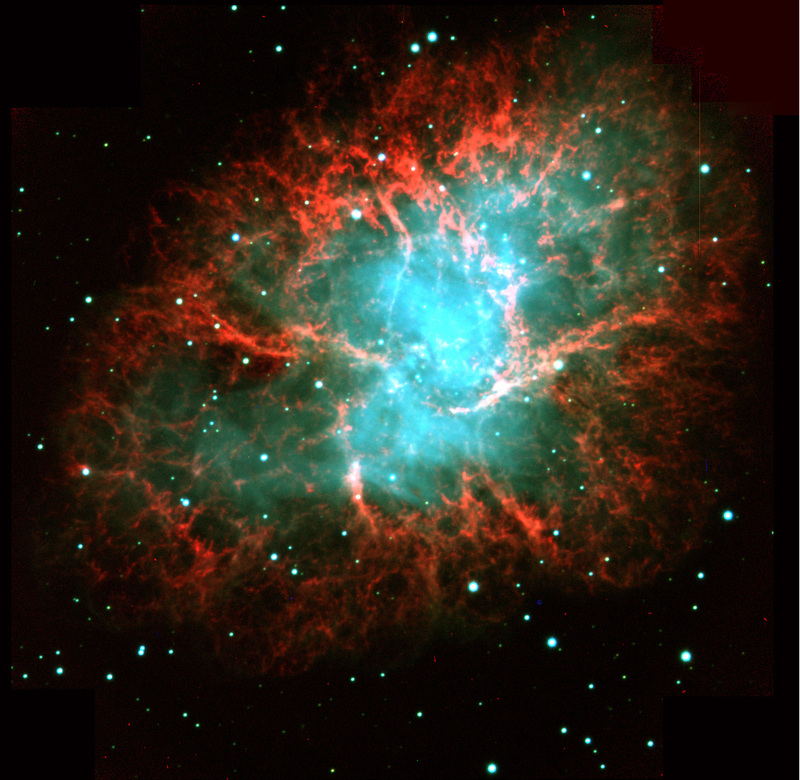 Imaged with MOSCA through BVR filters. 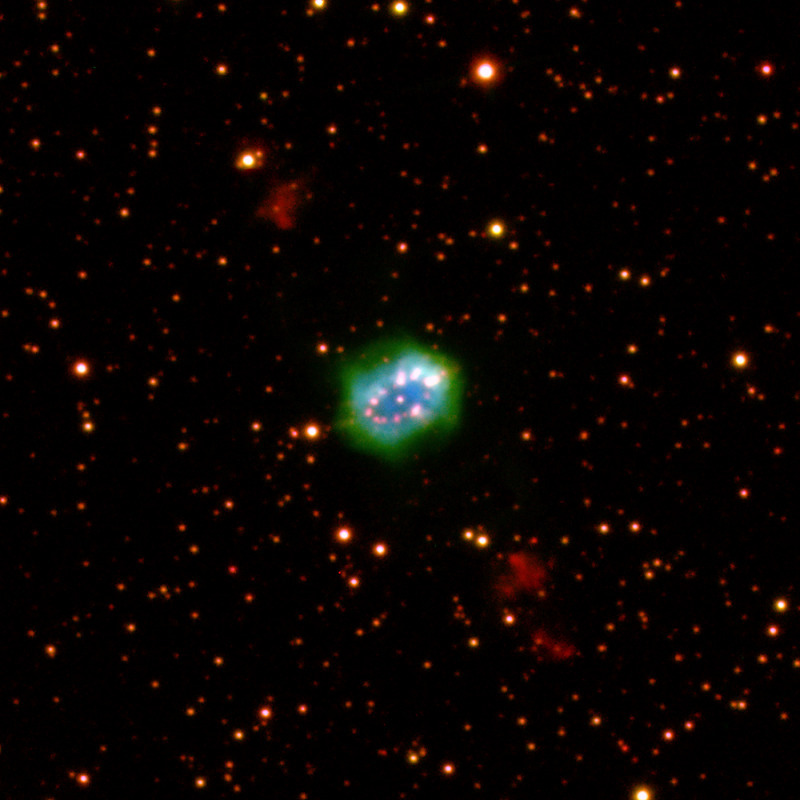 Green and blue filters were used for the [OIII]5007 emission: two colours were used for a single emission line because of the large dynamical range of the nebula+halo (there is a contrast of 1 million between the faintest and brightest structures detected), and the objective was to display the three different components of the nebula, i.e. 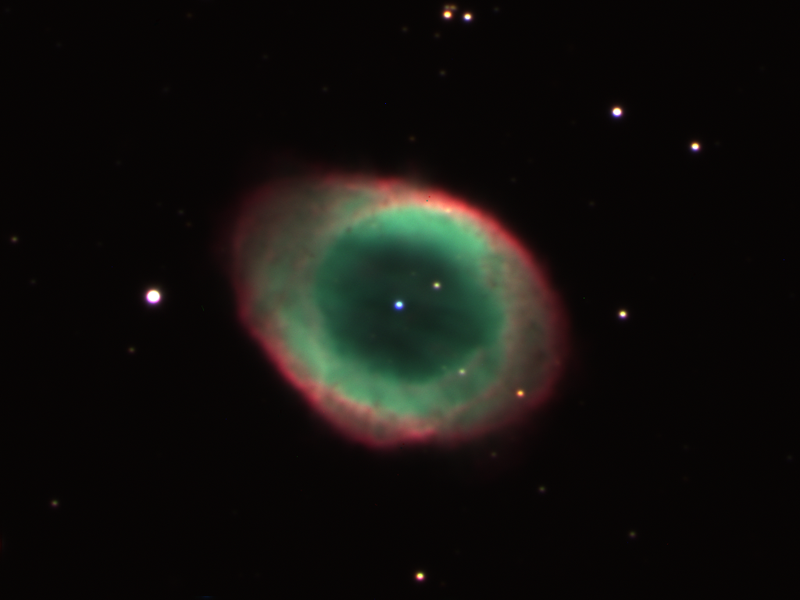 inner nebula, first halo with the (in blue) rings, and outer filamentary halo. Red is instead [NII]6583. 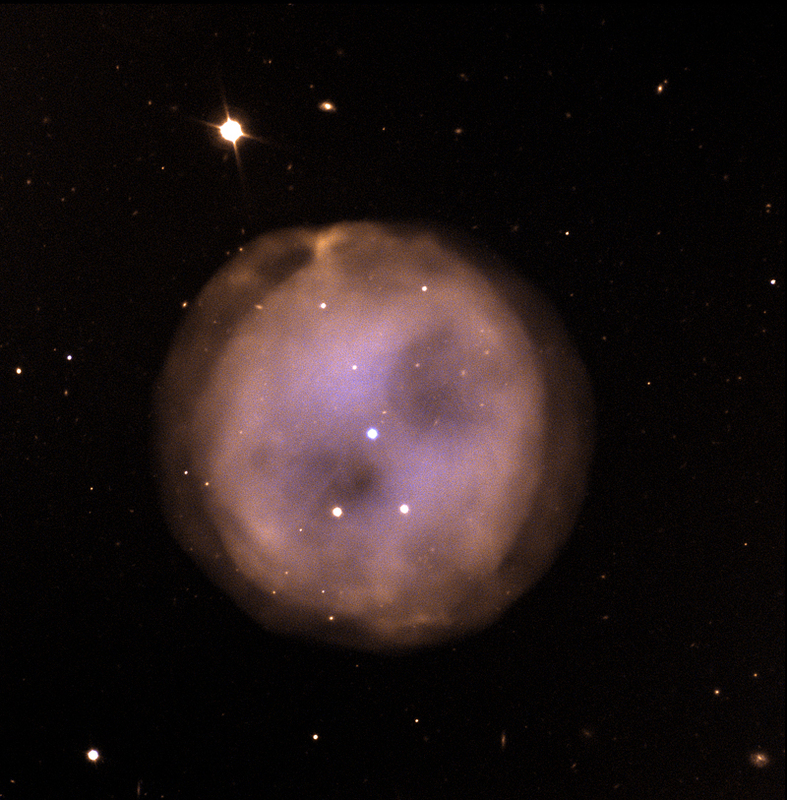 The image is the deepest ever obtained of NGC 6543. 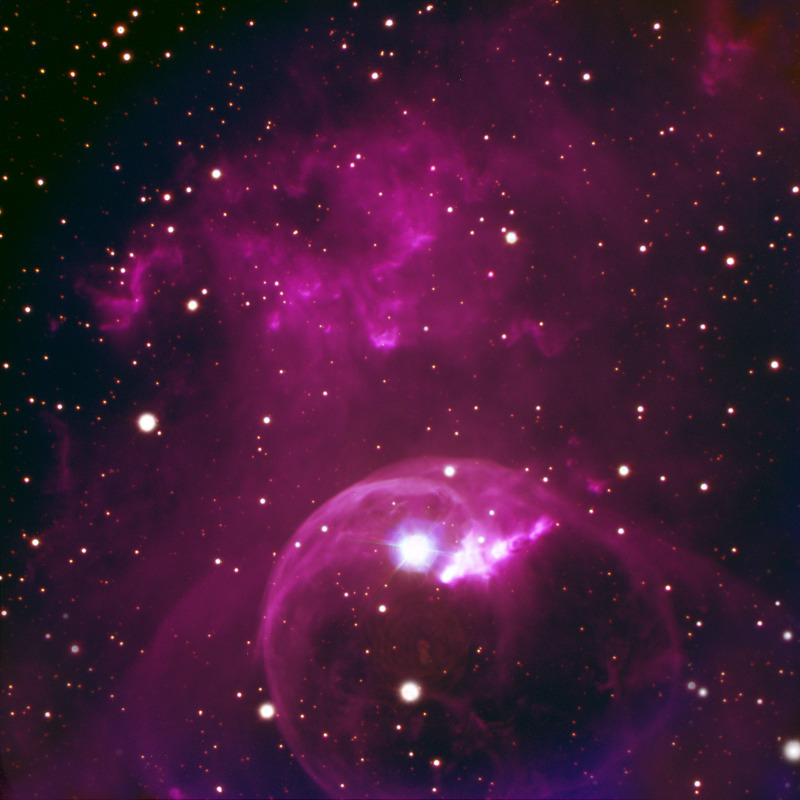 Imaged with ALFOSC through the H-alpha filter. The Rosette Nebula is an emission nebula in the constellation Monoceros at a distance of about 4500 light years. It surrounds a cluster of young stars. 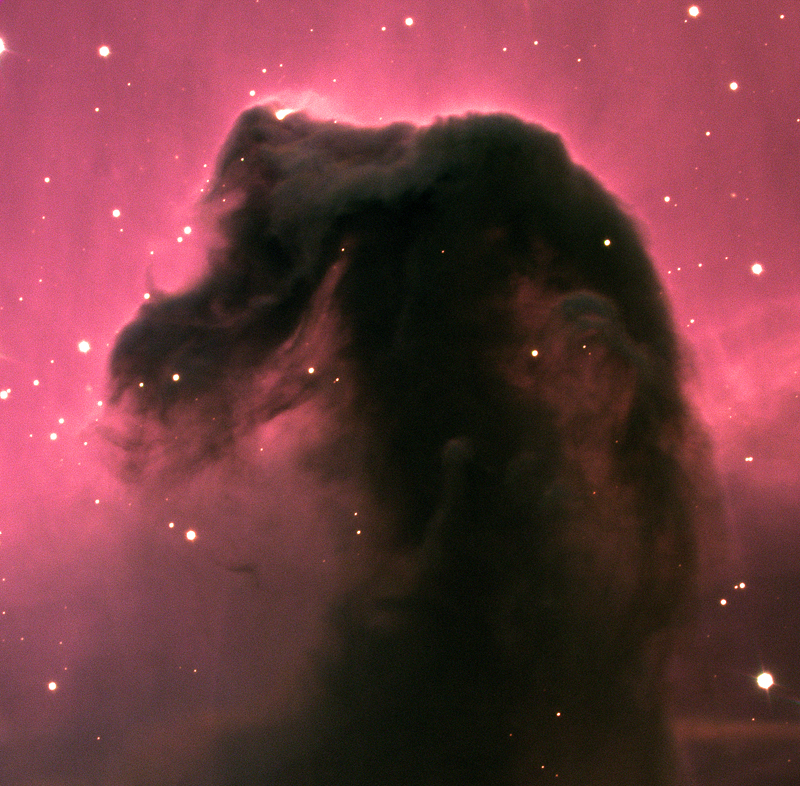 The filamentary structure of the dark cloud is prominent and the main elephant trunk feature in this image appears twisted like a coaxial cable. In collaboration with Per Carlqvist, the Alfvén Laboratory, a new theory has been developed describing the formation and evolution of twisted filaments. Observed in B (180s), V (120s) and R (120s) with ALFOSC during dawn. Observed in B (300s), V (300s) and H-alpha (600s) with ALFOSC during dawn. The image is a combination four images taken at NOT with the 1024X1024 StanCam CCD in R. The exposure time for each individual exposure is 10min. 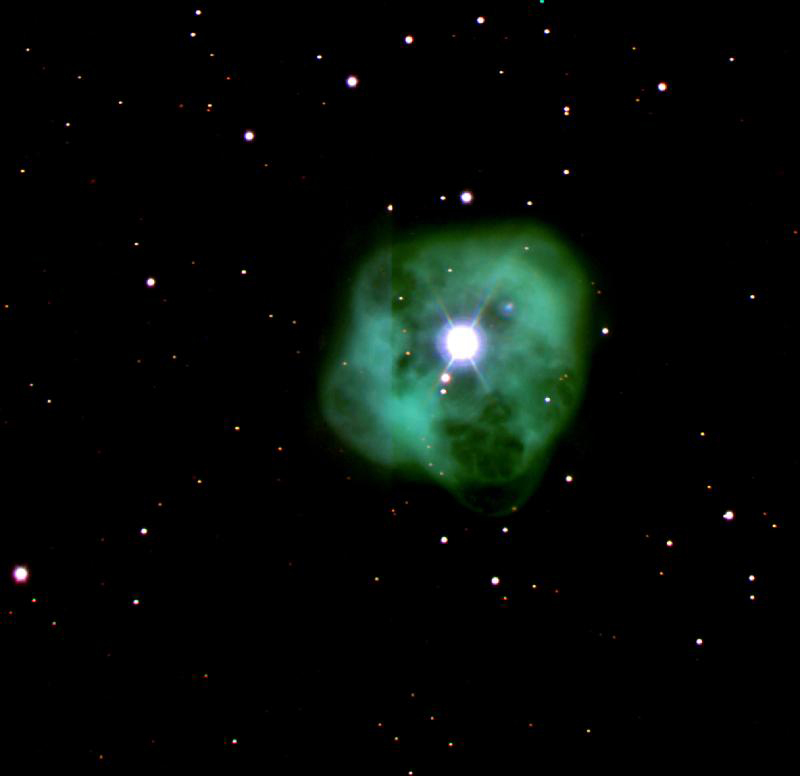 Observed with the NOT 1024x1024 CCD camera. 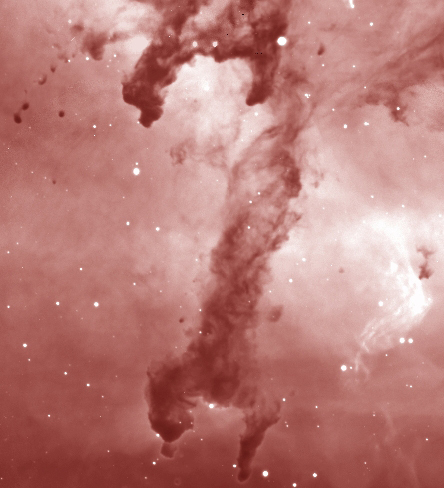 The image is composed of 3 individual 10 min exposures through b, v, and y Strömgren filters. The seeing of these images was about 0.5 arcseconds, the field of view is slightly under 3 arcminutes. 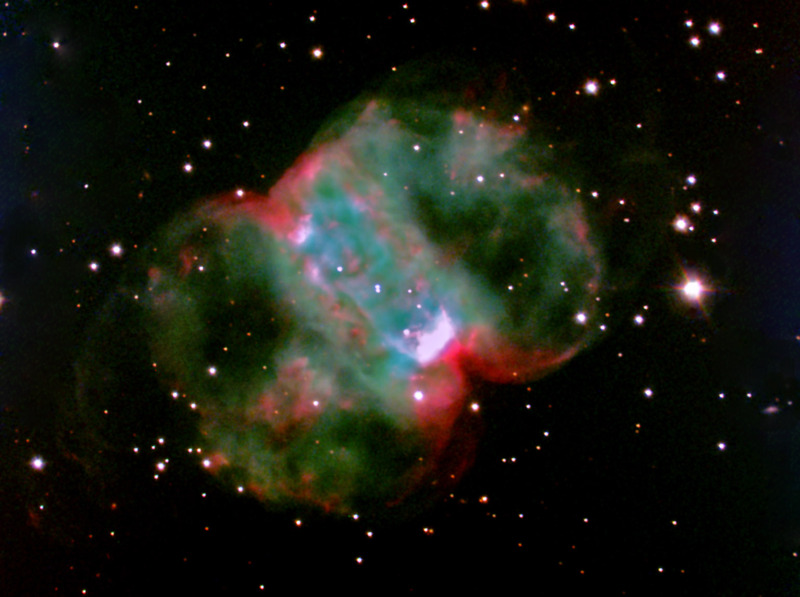 Planetary Nebula, a composite H-alpha (Blue), V (Green) and R (Red) image. 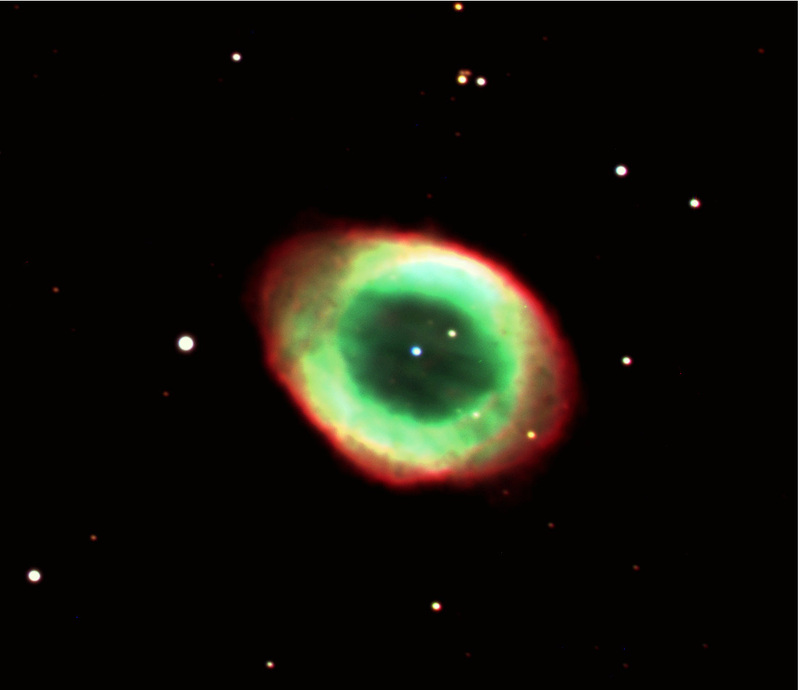 The Ring Nebula. 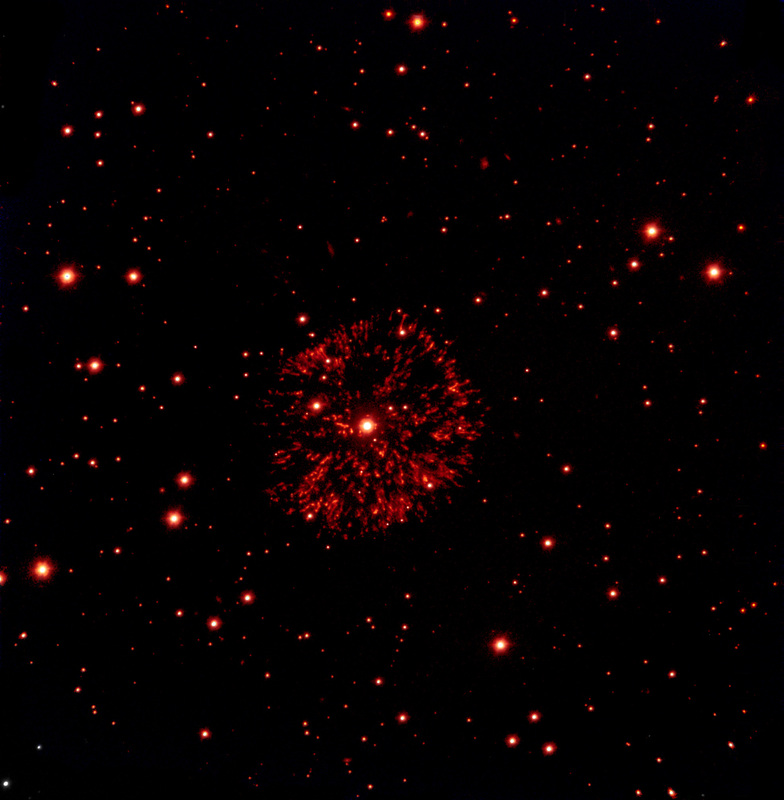 The image is a composite of 200s B and 100s V and R exposures. 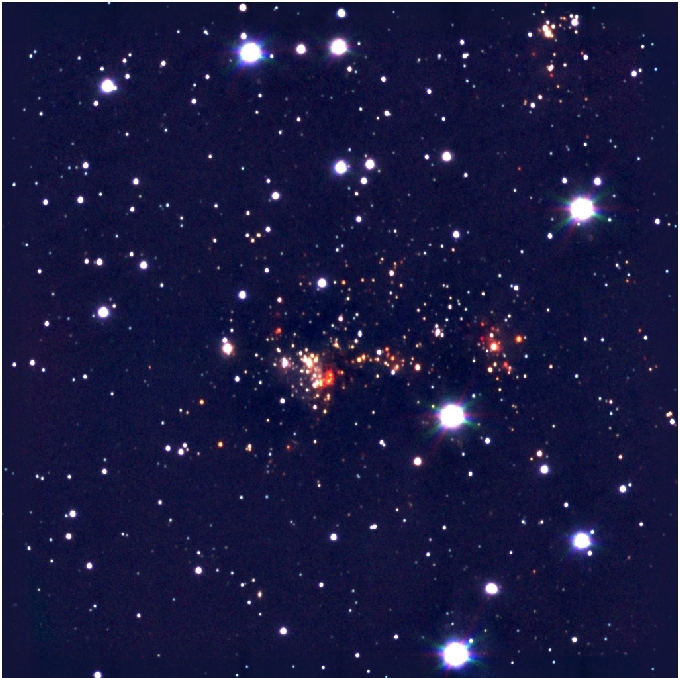 A stellar cluster in formation, composite J (blue), H (green) and K (red) mosaic obtained with Arnica. The field is 8 x 6 arc minutes, and the pixel size 0.53 arc seconds. 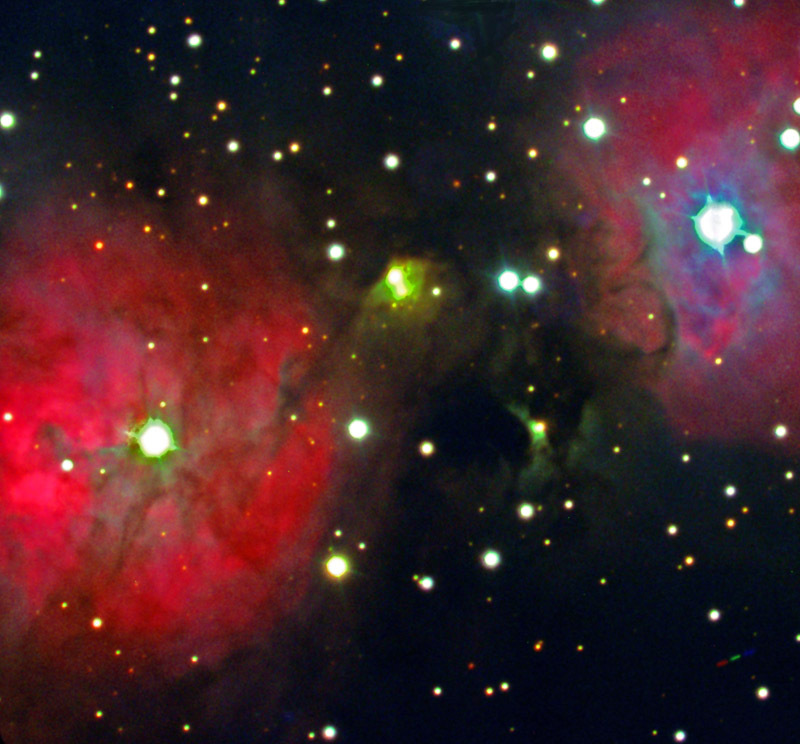 Image is a combination of 300s B,V, and R exposures taken in twilight with ALFOSC. The field of view is ~5' and the seeing was ~1.2 arcsec. A nice extra feature is the asteroid in the lower right corner (the different coloured dashed line). 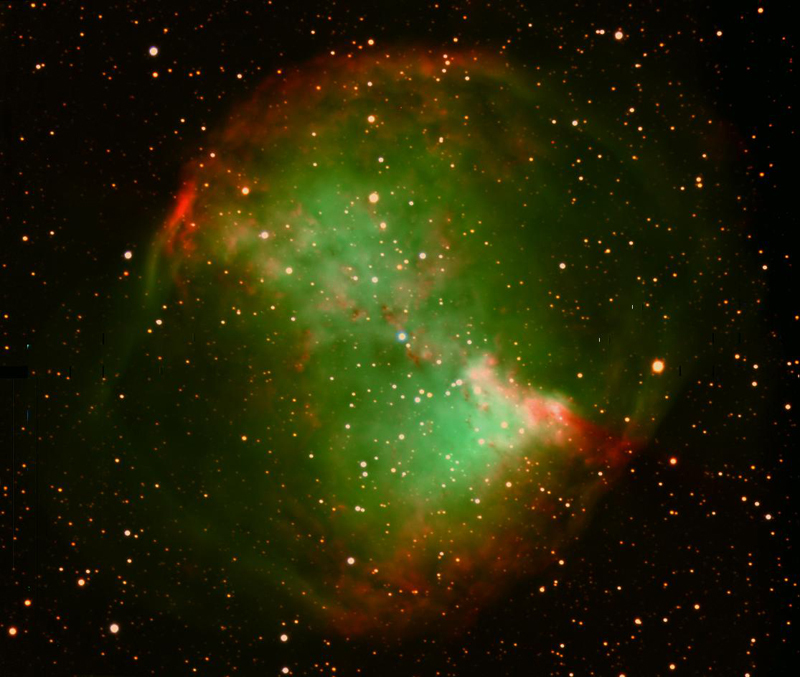 Little Dumbbell Nebula. Image is a composite of B, V, and R exposures. 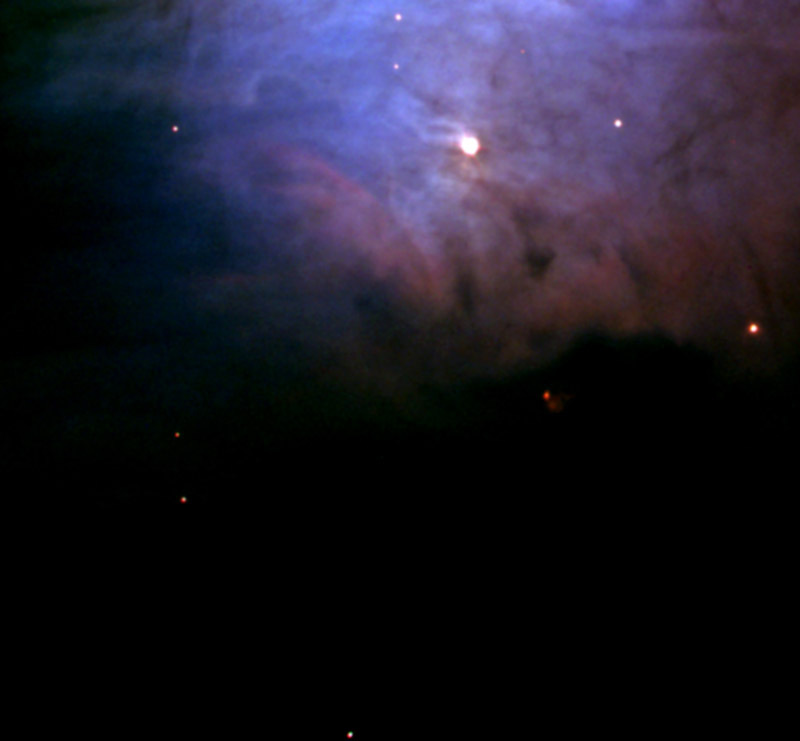 An emission nebula in Orion. 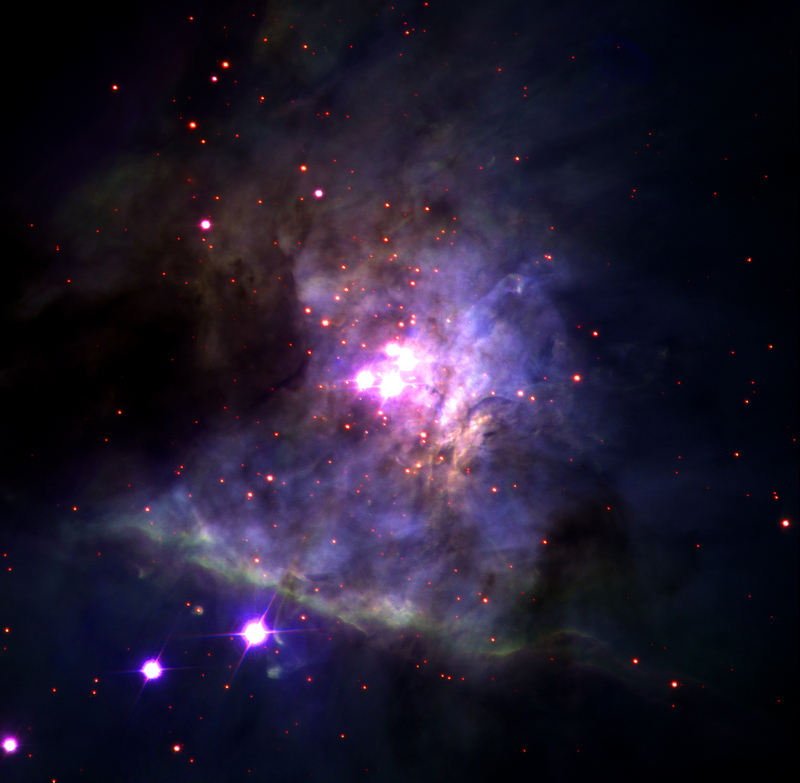 Image is a composite of B, V, and R exposures. ALFOSC with B, V and R filters in very good seeing. ALFOSC with B, V and R filters. The discrepancy in the middle of the image is due to the use of A+B readout mode. 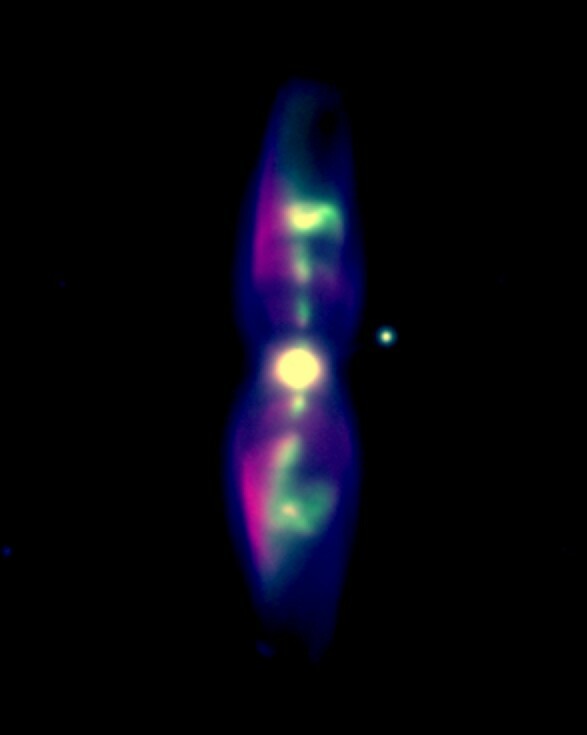 Colour image (OIII in green, Ha in red and blue) and an animated [OIII] gif of the evolution of the "lighthouse" of the extraordinary Butterfly Nebulae. 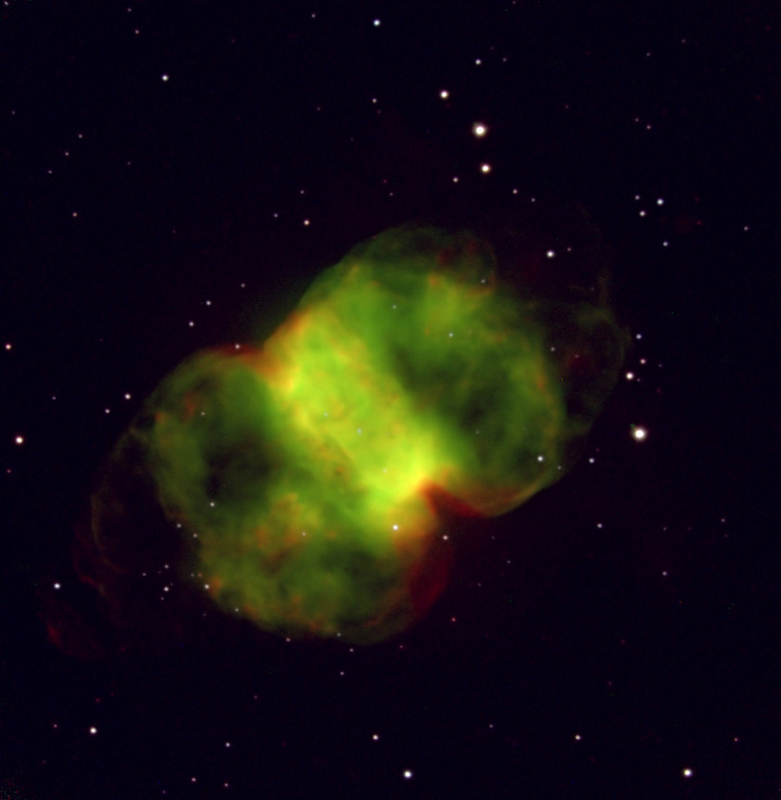 False colour image which is a composit of red from 5 minutes of 3nm Halpha filter, green from 5 minutes of 3nm O[III] filter and blue fron 30 seconds standard B filter with ALFOSC. Seeing was better than 0.8 arcsec. A mosaic of 8 images shot through a wildly varying cloud cover and seeing. Also seen is the HH399 Harbig-Harow jet at seeing 0.8 arcsec. 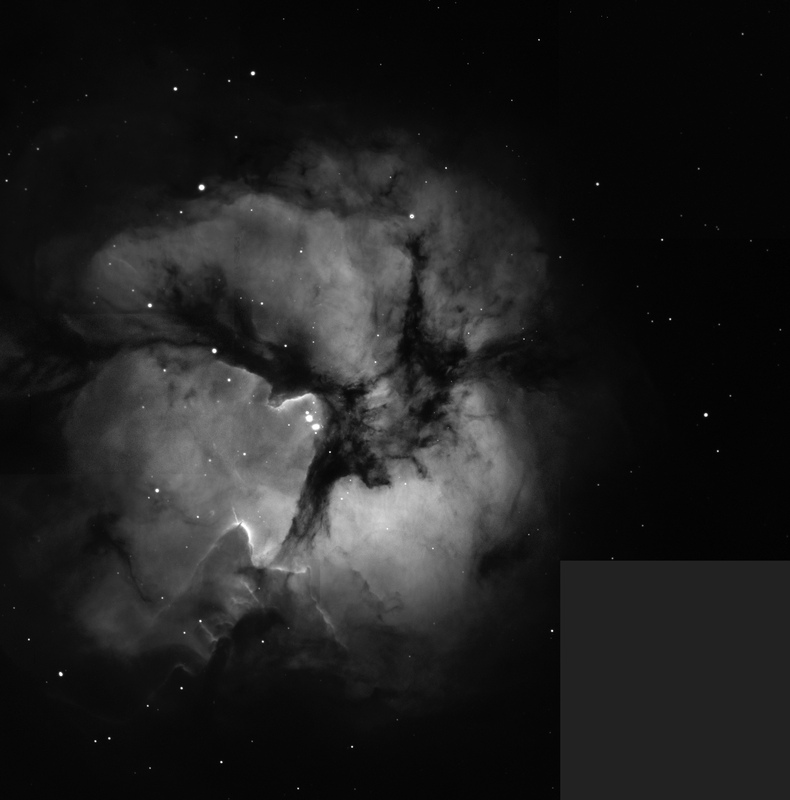 ALFOSC with 3nm H-alpha filter. 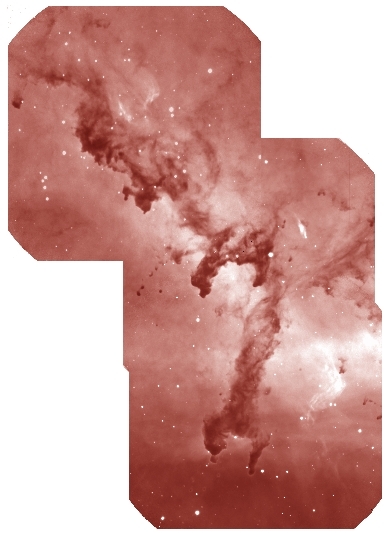 JPG (1.2Mb) Caption: A part of the Eta Carinae nebula, NGC3372. Imaging done with ALFOSC. 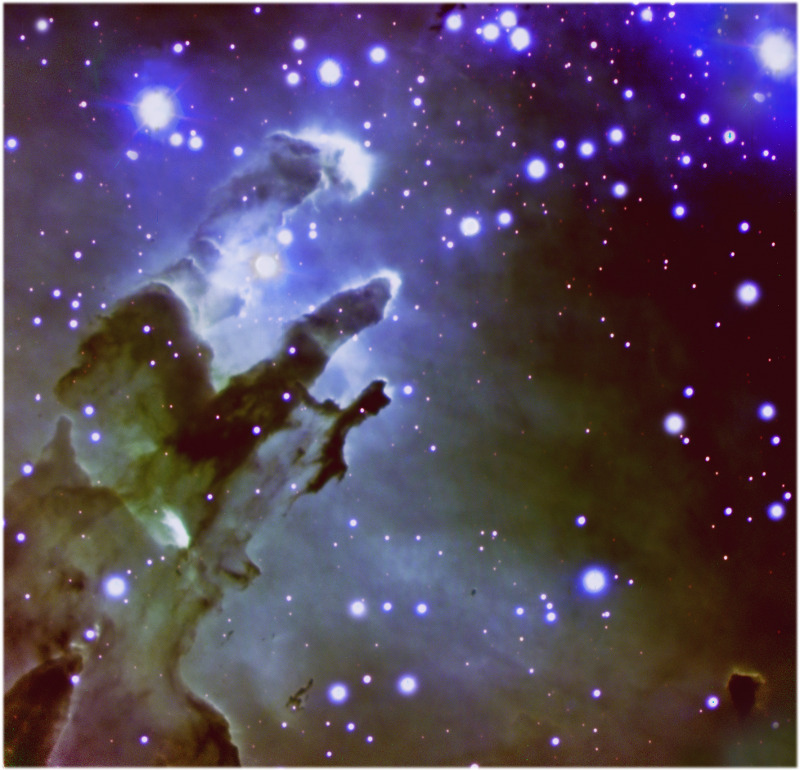 JPG (292kb) Caption: A new young cluster discovered at the position of IRAS 04186+5143, previously thought to be a galaxy. 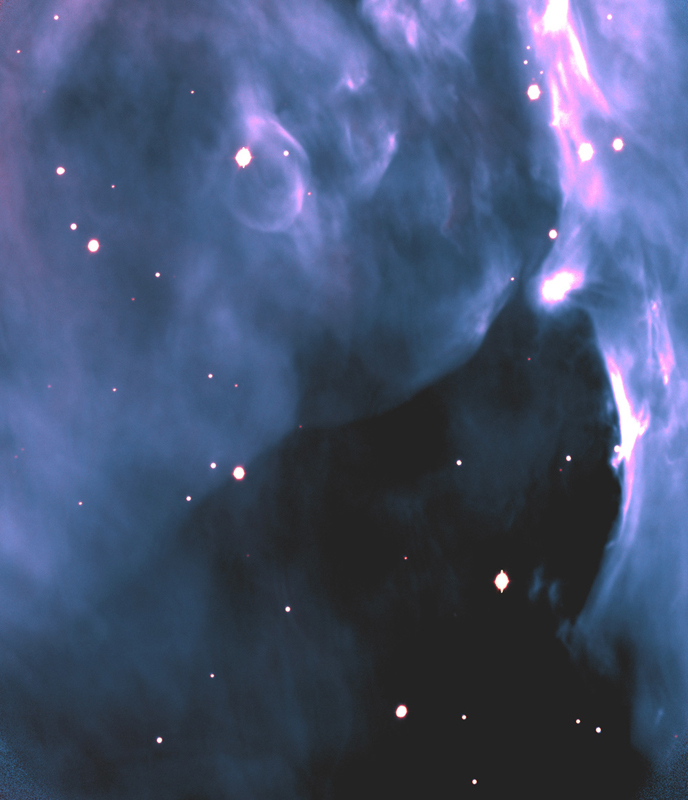 Observed with NOTCam in J (18x48s), H (18x48s), and Ks (18x36s) filters in 2009, FOV=4'. 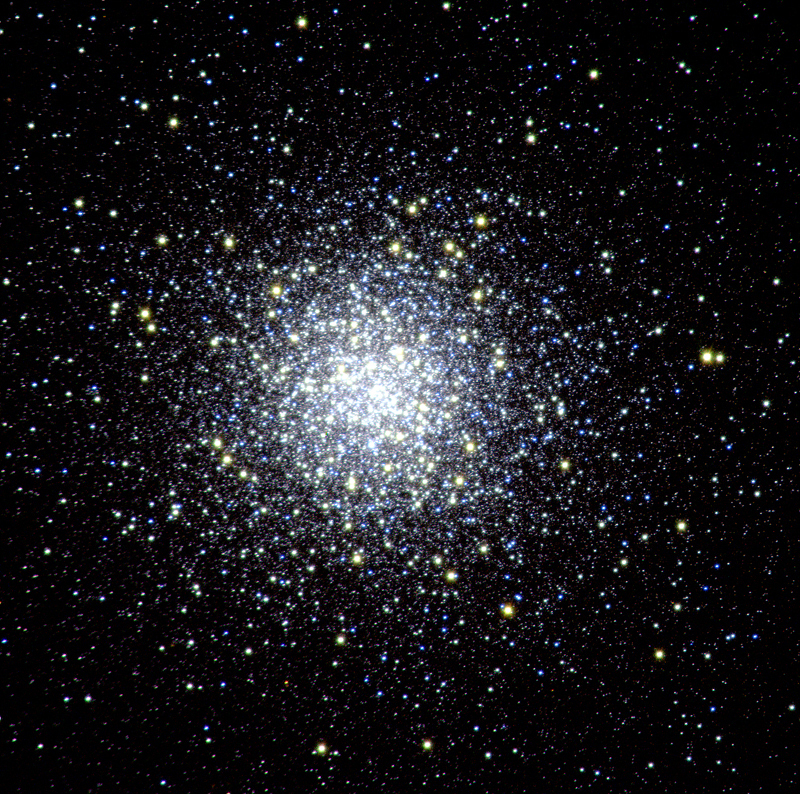 The cluster is at a distance of 5.5 kpc from us and located in the outer Galaxy. 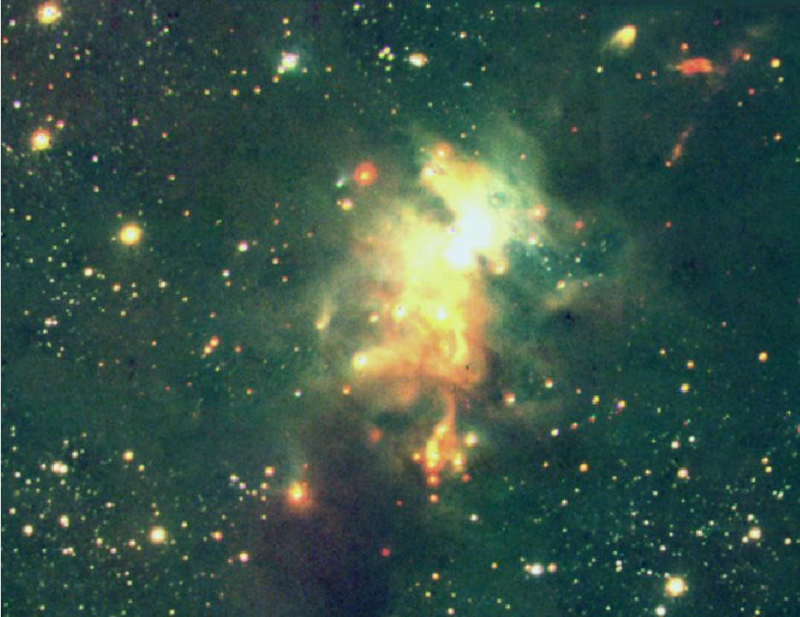 It has a large fraction of protostars (Class I sources) and molecular gas and is currently actively forming stars. Published in Yun et al. 2015.